wherein i pretend to give decorating advice. Heh. Just the title of this post makes my inner voices giggle. But I got so many emails asking “HOW DID YOU DO IT?” in regards to the before and afters of my dining room that I’m now writing this. To prove that I am flying by these, the seat of my pants. 3. I stick to one color scheme in everything I do. It is both safer and cheaper this way. For example. 90% of the time I wear warm browns and/or deep jewel tones. This does two things, A) everything goes with everything else and B) It keeps me from buying that hot pink sweater no matter how cute it is because it won’t go with anything. I did this with everything I picked for my house. Everything is a warm neutral so everything goes with everything else no matter what room it is in. -Stole the sheer in the back/drape in the front look from my friend Megan, who stole it from Pottery Barn. Double drape rod from PB? $200. IKEA? $16.99. 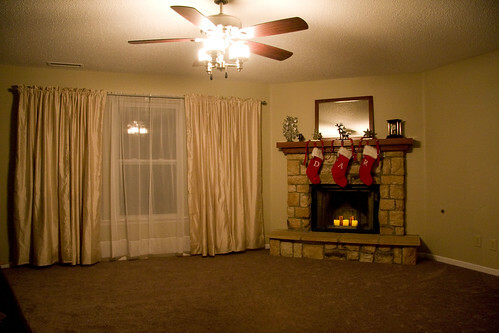 -LED candles in the fireplace? THANKS FOR THE IDEA RESTORATION HARDWARE! About $20 each at their store, Kohls? $4 each. The mirror on the mantle? Williams Sonoma Home $1,295. Overstock sale at University Loft? $15. -Chandelier and Kitchen lighting? IKEA, less than $50 each. If you’ve ever priced lighting? Then you know what I’m talking about. Also? The chandelier I picked out was black steel. $4 can of spray paint and it’s now brushed nickel. Somewhere an interior designer just died. Is this all stuff people already know? Eh, if so, sorry. Maybe one person will find it handy. Because let me tell you, trying to pick out stuff you have to live with and someday maybe have to sell to other people? Kinda tricky. But whoo. Fun. If you give the moosh to daddy. This is so lovely–I have been excited to see what you would do with the interior of this house–after getting over the shock of the previous existing colors! Bravo! I decorate the same way. Steal from the rich. My chandeliers look JUST like PB ones only I got them on overstock dot com. Naturally, I blogged about it. Because DUH, it was like a 1/4 of the price. Same goes for my kitchen hardware. THE same style as Restoration, only I paid $300 less for the entire kitchen. I do the same thing for clothing, yo. @OHmommy, I can’t bring myself to do fake UGGS. Is that bad? I just thing the fake ones would smell, and there’s a reason people starting and still do buy them in the first place. I had no idea that Ikea had light fixtures! I’m in desperate need of a few. Thanks for the tip! Your HOME is looking more and more like your place, and I couldn’t be more excited for you. Love it! Congrats! @Headless Mom, IKEA has MAGICAL light fixtures! And I can understand the need to put Monster TV out….I may be be moving into our lake house for awhile….first thing on my “goes to lake ” list ?? 60″ TV !!! You low-cost alternatives are freakin’ AWESOME. The spray paint was inspired–I’m not sure that even *I* would have thought of doing that and I’m all about window shopping the fancy stores then buying at Target, IKEA or even the thrift store. Casey, you are my hero. @Lisa in TX, We got the idea from Cody’s friend. Valspar, Brushed Nickel. Brilliant. Also…your awesome! 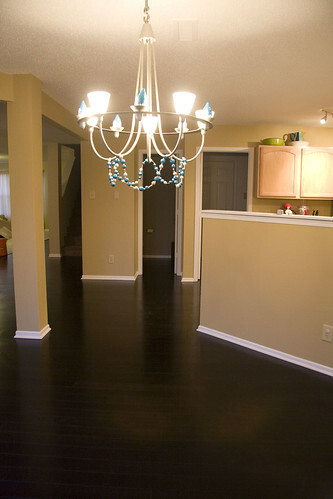 Also, your last pic is the BEST I love the dark flooring with the paint colors. Good job! @DesignHER Momma, It may be clean and new but not lickable clean and new. Casey, it’s still amazing! 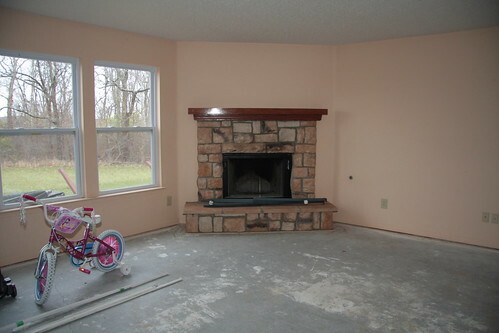 I went back and looked at some of the before pictures, and I don’t know how you were able to cover up that teal paint! It’s BEAUTIFUL! Also, still lusting after your gorgeous floors and now longing after your monster TV! @Erika, $3,000 to a professional painter. That’s how. Heh. I am such an idiot. I live in Han**** County, and saw that the University Loft was having an open to the public sale, but decided I shouldn’t go. I had no idea they had all that cool stuff. So, just to recap: I’ve been driving over to Cincy to go to IKEA, but missed the best sale in my own backyard. Aaagghh! You’d better believe I’ll be front and center next time they decide to do that! YOUR house is really looking great! it looks great Casey. I must really get to IKEA some day to see what the awesomeness is all about. @Heather @ Domestic Extraordinaire, YOU LIVE IN OHIO AND YOU’VE NEVER BEEN? Good hell. @Casey, Cincy is 4 hours away…that is my excuse. OMG> isnt renovating exhausting/so fun!? We renovated our kitchen, bathroom and changed a whole bunch of other stuff in our little 1950s house 2 winters ago. It was both satisfying and frustrating. I will not lie. It was tough. BUT. the choices I made all came out amazingly and we love living in something that suits us, and we can be proud of. I will strongly advise avoiding all home reno/fixture places for about 2 years after completion of a project. I literally stood in the lighting section of Home Depot 2 weeks ago and said *mother****er* out loud when i saw the NEW lighting they have that I could NEVER find when I was redoing our home. Thats the only kicker! Your home looks fantastic! The flooring alone is fantastic. I too loved finding cheapy alternatives to the craziness. It became a bit of a hobby that is hard to lose! ok, enough. I love the renos. @leel, I know exactly what you’re talking about! Taking your advice. Running with it. Heh! 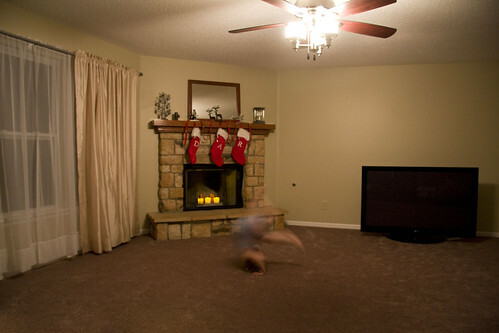 I love the somersaulting toddler! I have been dying on the vine, waiting to see some pictures! Thanks for sparing me, girl! Just gorgeous. Simply gorgeous. I have been hesitant to consider bamboo, but you’ve made a believer out of me! Another treasure trove for designer knock-off stuff is Kirkland’s @ Castleton Mall (park @ H&M). You’re my kind of decorator. The new place looks lovely! Check out the form of that somersault! Very impressive. The optional preschooler has got some serious skills. I love how that Chandelier has the makings of a delicate necklace I would like to wear! You did good. Very good. Good thinking on that brushed nickel idea! Architectural Digest is also a good magazine to pull pages from. Your bamboo floors are beautiful, we have the lighter color bamboo in our home. But word of warning…the wood is very soft, anything that gets dropped on it will likely leave a small dent. We have a houseful of kids so you can imagine the things that get dropped around here. But I still love our bamboo floors, dents and all. You are speaking my language. I am just now hitting that time in my life that I need to get serious about our house and what’s in it. WHITE WALLS. White walls after 10 years. I hang my head in shame. But I’m getting there! Everything looks fabulous! I hope you are LOVING your new home! Beautiful choices and I think it’s fun to read about other people’s bargains! ALSO, I love your writing style. I love, love, LOVE the floors in your kitchen. GORGEOUS! Everything has come together so nicely. Great job! love it!! you are my kind of girl! but you know what’s really bugging me? the initials on the stockings. I get the “A” (duh)…but…”D” and “R” are killing me. are they for Dad and Red? Maybe? why is this bugging me?? I have a secret love affair with spray paint. It has found its way on to sooooo many old and outdated items in my home. Much cheaper to paint it than replace it. I can’t figure out the initials on your stockings either. I know about the A, but where is the C? Isn’t your name Casey??? Is it an inside joke or something? Never mind, I just read the post where you explained the stockings. Cute! Oh my, those dark wood floors make me a bit weepy. Want. Love. Real UGGS rock…why? Because they’re real. Owned my first pair in 1986 before they were even remotely cool. I need another pair. I’m drooling and weeping and lusting. Beautiful job!